second baseman Freddy Galvis has been suspended for 50 games by Major League Baseball, the commissioner’s office announced Tuesday afternoon. Galvis tested positive for metabolite of Clostebol, which is a performance-enhancing substance and in violation of MLB’s Joint Drug Prevention and Treatment Program. Galvis, 22, has been the Phillies’ most frequent fill-in for injured Chase Utley at second base this season. 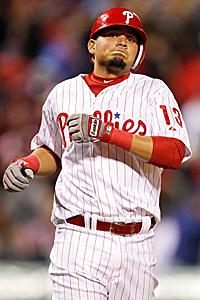 Galvis is hitting .226/.254/.363 with 15 doubles, three homers, 24 RBI and 14 runs in 200 plate appearances. "A trace amount of a banned substance — 80 parts in a trillion — was detected in my urine sample. I am extremely disappointed in what has transpired. I cannot understand how even this tiny particle of a banned substance got into my body. I have not and never would knowingly use anything illegal to enhance my performance. I have always tried to follow the team’s strength and conditioning methods, listen to the trainers, work out hard and eat right. Unfortunately, the rules are the rules and I will be suspended. "I’d like to apologize to my all my fans, especially here in Philadelphia and back home in Venezuela, to my teammates and to the Phillies organization. I am looking forward to putting this behind me, rehabilitating my back and returning to the Phillies as soon as possible to try to help them win another World Series."